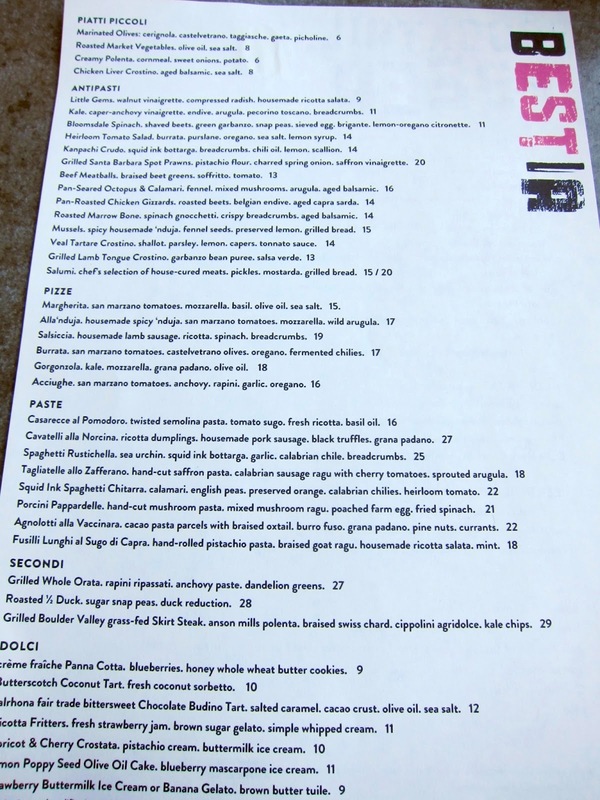 If you live in LA and you have not yet heard of Bestia, you ought to be ashamed. But not as ashamed as I feel right now for writing this belated review of a restaurant I dined at nearly three months ago. (argh!) But please, let's direct our attention to more pressing questions: Like, is Bestia really all that it's hyped up to be? Is it currently the "best" DTLA restaurant? Is it really a beast of a place? (1) Simple, straight-forward menu with dishes that sound more interesting than pretentious. Online menu here. Keep in mind that their menu is seasonal and is subject to change. Might I add that their mixologist/ baretender-extraordinaire, Karen Grill, has some damn impressive presentation skills? 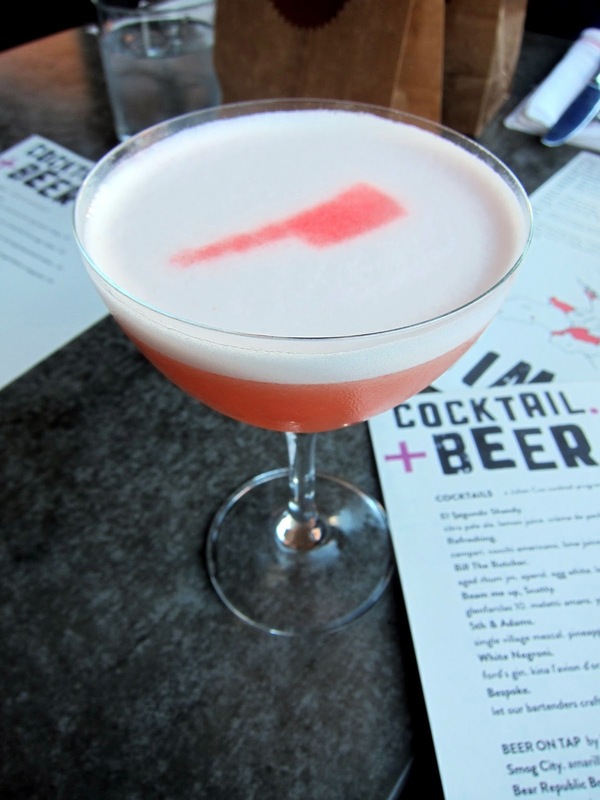 Seriously, how did she get that meat cleaver on that refreshing alcoholic beverage with such perfect, foamy precision? I may never know, but I do know she needs to keep doing what she's doing. (3) Delicious and beautifully-plated dishes that will make even the non-food blogger snap a quick photo before consuming the food. I'm a food-blogger that also happens to be Asian, so perhaps taking photos of everything I eat is a double given. Nonetheless, my fellow diners shamelessly and with attempted stealth, took photos to show off to their foodie friends. Why not? The food is pleasing both to the eye and the stomach. Unfortunately, that's a rarity at most restaurants these days. Bone marrow is the soft tissue that exists in the middle of a bone. It sounds unappetizing, and I understand if you pass, as the texture can be mushy and fatty. But Bestia's roasted bone marrow is one of the best I've ever had! You gently scrap off the marrow and mix it in with a perfectly-cooked dumplings of dough (gnocchi). Simply heavenly. Give it a try. * 'Nduja is a spicy, spreadable sausage made of pork. It adds a lot of flavor to the broth, in which I really enjoy soaking my bread. Yum! Both pasta dishes were as amazing as they look in the photos. I'm trying my best to hold back the drool. Loved the gelato the most! That is, unless you care to not share, which might be very tempting. (5) Neat interior design with an open kitchen. Attention all new and aspiring restaurateurs: All the cool kids have an open kitchen because they realize that eating at a good restaurant is as much of a show than a time to relax. Eating spaces with open kitchens typically mean the noise levels are high, but it keeps the vibe fun and hip. 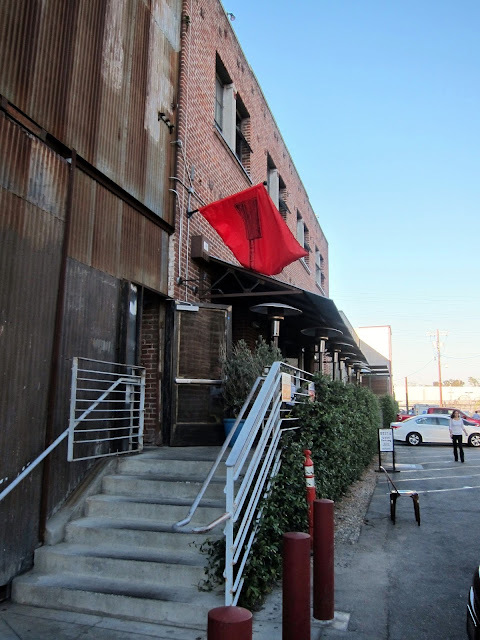 Plus, I think the former warehouse, converted to restaurant works really well for Bestia. Good work and thank you, Bill Chait! notes: Make reservations. If you want to be able to properly hear your friends without feeling like you're screaming, request patio-seating. If you're looking for a more lively atmosphere, sit indoors.